Tri-X, we started in January 1966 while I was recovering from injuries suffered in an auto accident. I was out of school for the semester and my mom said I could not send all of my time just watching TV, I had to read so what did I want to read about. Something made me say "photography". This image is from the Orioles 1979 magical season. It was clinch night, we needed one win or one loss by who ever was chasing but it was raining so our game was delayed so there was a lot of just hanging around. 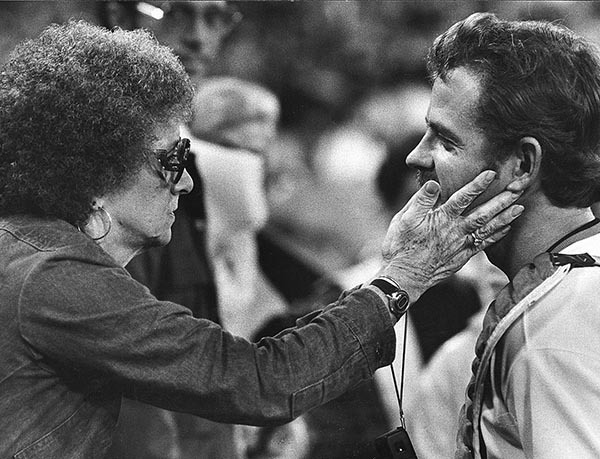 Orioles catcher Rick Dempsey came out to chat with fans and this lady Flo Kells reached out to touch her hero. It was a special moment, something we don't see today around MLB and I was way too tight with a Nikkor 180 2.8 on an F2 but it worked. Full frame, no room at all to crop.